Do you ever feel that you are tormented by the lies of the enemy? Have you been buffeted about long enough? Are you ready to be free? If so, look at the example of Galloping Gertie for some big inspiration today. On July 1, 1940, the Tacoma Narrows Bridge over Puget Sound (in Washington State) opened. It was to be the pride of the American Northwest. It lasted 4 months and 6 days. Shortly after it opened, the bridge began acting strangely. The roadway began to twist, rise, and fall in the wind. 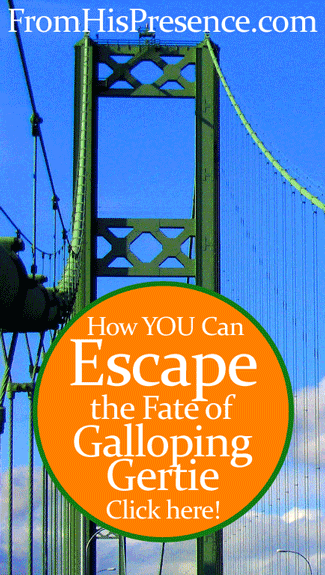 The bridge became known as “Galloping Gertie” because of its strange behavior. Eventually, the structure couldn’t handle the strain. It collapsed on November 7, 1940. So what happened to Galloping Gertie, and what does this have to do with you? Ultimately, Galloping Gertie collapsed because it came into agreement with the wind. The wind blew against the bridge. When that wind was at just the right frequency and strength, the bridge began to agree with the wind. The bridge began to resonate with the same vibration it received from the wind. And that vibration impacted the whole of the bridge. It was too much. The bridge wasn’t designed to handle the opposing force of that wind that blew against it. But poor Galloping Gertie had no choice–it couldn’t get out of the way–so it eventually collapsed. You and I have winds beating against us every day. They are the winds of lies–breaths spoken out by the enemy into our ears. The enemy wants us to agree with his lies, so we will collapse under the vibrations of enemy attack. God gives us a choice. He gives us TRUTH in His Word and in the Person of His Son, Jesus Christ. We don’t have to fall victim to the lies of the enemy. We can embrace truth instead. Choose life. Embrace truth. That’s how you and I can live victorious lives and avoid the fate of Galloping Gertie. Jesus Christ is the Way, the Truth, and the Life (John 14:6). If we embrace His truth, we won’t be vanquished by the attack of the enemy. We won’t be taken down by his lies. We will be so rooted and grounded in truth that we will be safe and stable and free. God’s truth is so strong that it will protect and defend us. It will keep us from sinning (Psalm 119:11). It will give us wisdom and direction to live each day in God’s perfect plan for our lives (Psalm 119:105). A choice is before you every moment. You can either agree with God’s truth and resonate with that, or you can agree with the enemy’s lies and resonate with those. And your choice will determine your results. God’s truth is so much stronger than any lie. But you have to decide TODAY which one you will embrace. Image courtesy of Jan Tik on Flickr via Creative Commons license. Photo cropped and graphics added.